When we got up, it was nice and sunny, just what we'd hoped for the past two days. Unfortunately we had an early train back to Tokyo, so we didn't get to enjoy, but we assume we'll be back to Kyoto one of these years. A sunny morning would be perfect for Kiyomizu, Silver Pavillion, or any of the other hills east of town that have viewpoints back towards town. The Bridgestone tire place was open today - not sure why it was closed the previous three days, but open today on a Sunday. We grabbed a quick breakfast at a cafe in the train station, then boarded the 8:53 Shinkansen back towards Tokyo, We were each listening to podcasts, and Justin heard ones in Michael Rappaport and David Chang - the David Chang podcast was coincidental since he was one of the folks we'd seen a video of at Bar High Five - it was like our trip was coming around full-circle. We lamented that two of the three nights we'd be in Tokyo were each on Sunday, the only night Bar High Five is closed. Again...next time. We stopped briefly somewhere (mabye Nagoya? ), but other than that it was a straight shot to Tokyo. 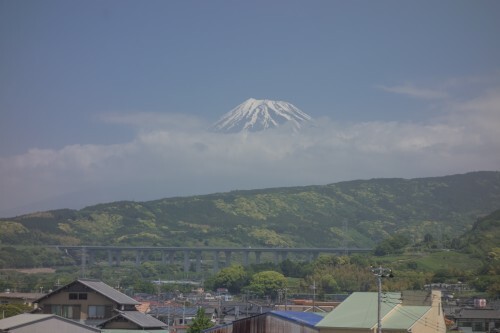 We weren't paying much attention to our surroundings until Crystal spotted Mount Fuji out the left side of the train. 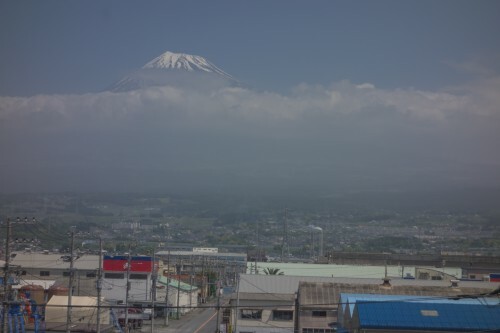 We weren't sure if it was Mount Fuji because 1) we would have thought it'd be on the right, and 2) we would have thought we'd be closer to Tokyo when we saw it, but no, it actually was Mount Fuji, as we were hugging the eastern coastline and thus almost everything was west of us, and also the train travel time was less than we originally thought. 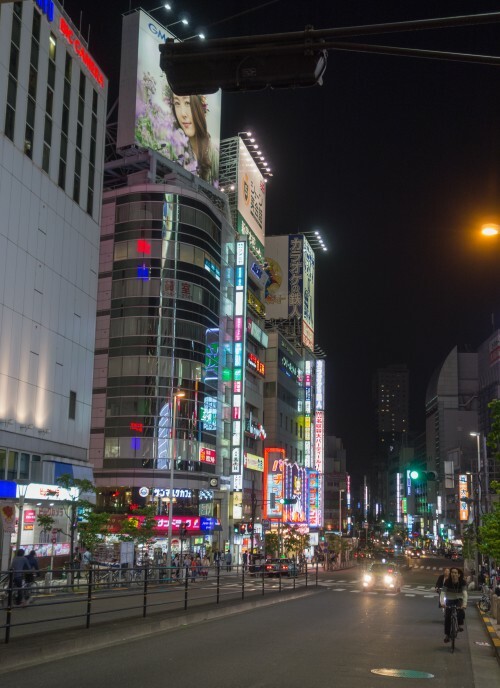 We arrived in Tokyo station at around 11:30, so we'd covered the 320 mile trek (just a bit shorter than Los Angeles to San Francisco) is just two and a half hours, and we didn't need to go to the airport. At Tokyo, we got on the subway to Akihabra. For being so close, the two stations aren't connected directly, so best as we can recall we took the Chuo line to Kanda station where we connected to the Ginza line, and we took that to Suehirocho Station, which is connected to Akihabra via an underground tunnel. It was a lot of walking with our non-wheeled duffel bags. At Akihabra, it got a lot easier, as we just got on a train, the Tsukuba Express, which starts at Akihabra and ends in Tsukuba, where we were headed. So all we had to do was get on a train and wait until it came to its final spot. It was nice and sunny in Tokyo as well, albeit kind of smoggy again. The train ride to Tsukuba took about 45 minutes, and when we got off the train it was apparent we were in the suburbs. The train station was virtually empty, and outside the buildings weren't very tall and there was a good amount of open space. We caught a cab that took us to Dewey's office, where he needed to pick up some paperwork that had arrived in the office on Friday. From there we hopped in Dewey's car and he drove us to their apartment, where we quickly dropped our stuff before heading to lunch. For lunch we went to a nearby steak place, and this time there wasn't a lick of English writing on the menu. So we did our best to guess based on the pictures, and for the wine we just randomly picked one - it turned out to be a Pinot Noir. If we could have ordered a Malbec or Shiraz that would have been better, but the Pinot was fine. We ate entirely too much food, yet again, and then waddled back to the car and took a short drive to Dewey and Clarita's. Their apartment is quite spacious for Japan, something like 850 square feet. Particularly notable was that when the bathroom light was turned on, the toilet seat lifted up and music came on. There was also a very nice balcony that had a good 180 degree view. 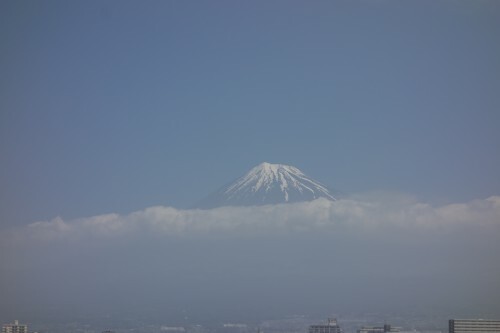 There was an absolutely huge Buddha to the north, and on clear days you can see Tokyo Tower and Mount Fuji to the South. This was not one of those clear days. 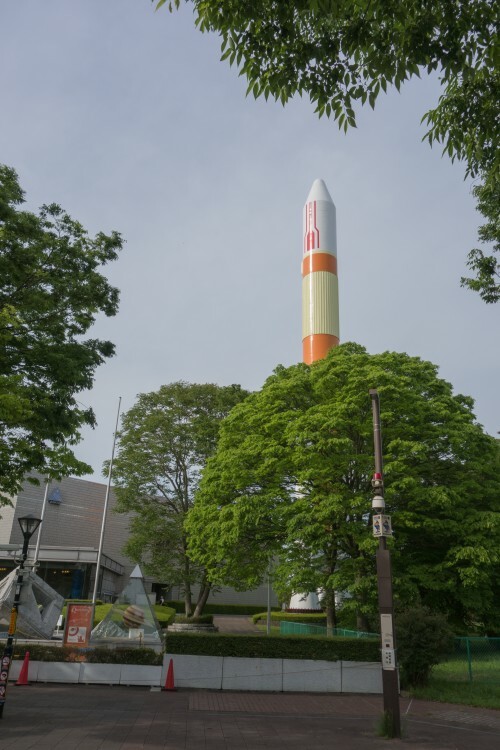 After hanging out for a bit, and Crystal remembering to deliver the Mother's Day card that she'd carried all week, we took a walk around Tsukuba. 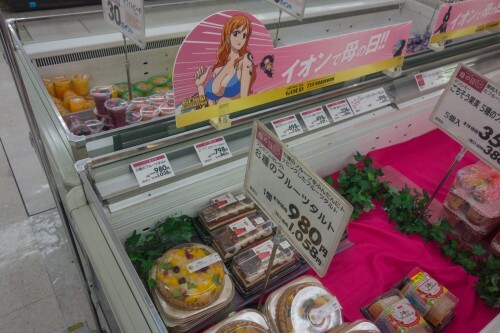 We went to the local grocery store that Clarita goes to most days, and tried to help her find some barbecue sauce. It's amazing how difficult it is to get the sauce you want when all the sauces look vaguely the same and there are dozens if not hundreds of them. We also went from the store to the local park - or should we say, part of the local park - that was space themed. There was a large rocket statue that stood up above everything, and on the ground there were small statues providing information on each of the nine planets (they counted Pluto). We realized as we were walking along that the statues were spaced in the same way they are spaced in the solar system, so the first four were very close to the sun, Jupiter a bit further, and then they really started spacing out. While the first four planets were probably all within 25 feet from the sun, Pluto must have been close to 1000 feet away. After walking around for a bit, we needed to head back so that we could get on a train back to Tokyo. 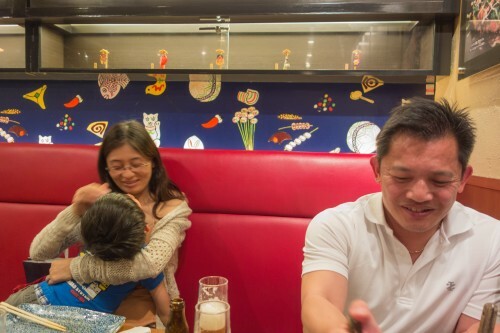 Our college friend Marc and his wife Yuka and son David live in Tokyo, and have lived there for close a year. Marc is there for a work project, so like Crystal's parents, he won't be there long. We wanted to meet with him while we were in Tokyo, but when we arrived a week ago, he was in Cambodia, leaving all of the craziness of Golden Week. But since he was back, we'd arranged with him to grab dinner and drinks before heading to the airport. So around 4:45 we said our goodbyes to Dewey and Clarita and got back on the Tsukuba Express, and we arrived at Akihabra at 5:30. This time we were on our own, but we'd kind of gotten the hang of everything, and got on the JR Rail Chuo Line Train for Shinjuku. We waited for our train, and gathered from the way that the train information was being listed that our train was running late, as "later" trains kept appearing before our train on the schedule. Ours was about 10 minutes late, and we almost didn't get on since we noticed no one else was boarding, which seemed odd. But we did get on, and then after we sat down the conductor asked for our tickets, which we didn't know we needed. We thought our pasmo card would be sufficient, but apparently this express train was a bit nicer and required an additional fee, which thankfully we were able to pay on the spot. We got to Shinjuku in short order, and then found Marc where he instructed us to find him. Marc helped us procure a locker for our stuff, and then we went outside where Yuka and David were waiting. We walked into a nearby mall and went up to the top level where restaurants were. We got some Okonomiyaki, one of the only types of Japanese cuisine we hadn't had on the trip. 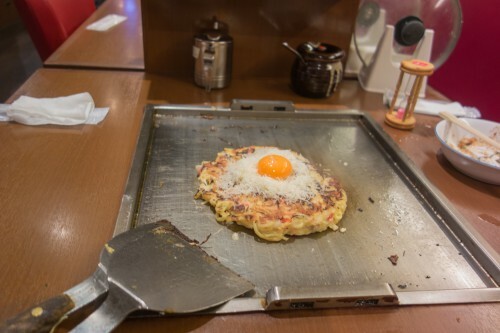 Okonomiyaki is a savory pancake with a wide assortment of possible ingredients. Our best guess (we didn't bother to check) is that we ate at Botejyu, specifically the Shinjuku Subnade branch. Both of us, plus Marc, got the pork okonomiyaki, which had noodles, pork, cabbage, some sort of sauce that got mixed in before putting on the griddle, and a raw egg to put on at the very end. Yuka and David split a different flavored one; we have no idea which one it was. We cooked these one by one on griddles that were in the center of the table (like the steakhouses, but with a griddle instead of grill), and each tried our hand at flipping the pancake halfway through. We all succeeded. They were pretty good, but we'd likely have ramen, sushi, steak, etc. before them if we had a choice. After dinner Yuka and David went home and Marc went out with us for a couple quick drinks before we had to leave for the airport. 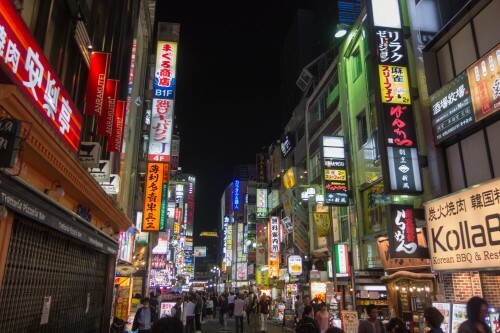 We walked around in Shinjuku, which had more - and brighter - lights than Ginza had. 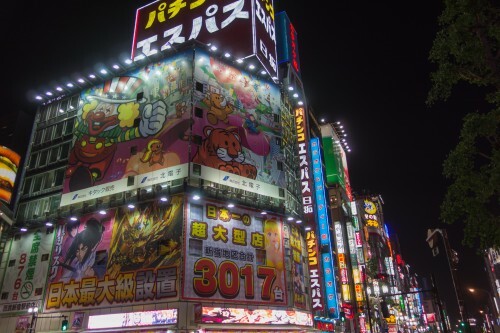 This was kind of what we expected for Tokyo, so it was good to see it, even if just briefly on our last night. We stopped in at St. James, an Irish pub not too far from the train station. We had time for two rounds, and used up the last of our cash in the process - perfect. 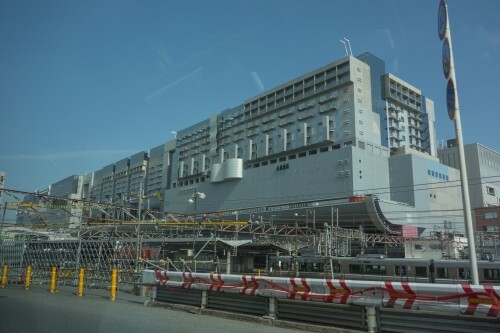 Then Marc led us back to the train station where we grabbed our bags, then we took a short cab ride to a nearby hotel where Marc told us we could get a bus ride to Haneda airport. We were able to pay the cab fare with our pasmo card, which was great, and then at the hotel we paid for our bus fare with a credit card. It was a little after 10 when we got on the bus, and even with a second stop at a busy bus station, we were at the airport by 10:30. Haneda, to the extent it is an available option, is much closer to town than Narita. Check-in at the airport was easy, and they were nice enough to tell us that we'd have to pick up our bags in SFO, which we already knew, but many might not. The agent also told us that we could hang out in the ANA lounge because of our status on United. When we walked in, we immediately thought that the lounge in SFO needs some upgrading. 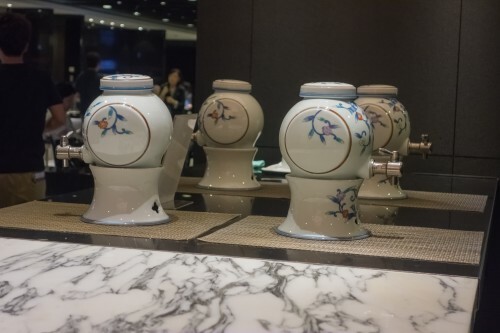 This lounge was off the charts, with bottles of booze all around for people to just pour themselves, plus several different sake "taps" and a couple machines that automatically tilted and poured beer. We got our money's worth, and got a little more when we heard that our flight was delayed 20 minutes. We boarded the plane around midnight, and were asleep in no time. We woke up just a few hours from SFO, about 4pm Pacific time. In the remaining time, Crystal read and Justin watched Star Wars, Episode IV (the original one from the 70s). We landed around 6pm, got through immigration and customs quickly with our Global Entry stuff, dropped our checked bag at the transit drop, but then we had to go through security again. This was not any fun. Justin got randomly checked, and then when they swabbed his hands that resulted in a positive, so then they had to check all of bags in thorough detail. The TSA guy knew it was all BS, as when he saw the positive test he rolled his eyes and muttered under his breath. Good to know that even TSA knows most of what they do is for show only. While TSA was checking our bags, some tourists were livid that their bags weren't being checked yet, and were getting increasingly vocal - we felt like telling them that they weren't before us in line (as they claimed), but rather that we'd been standing here so damn long they just didn't recognize us. Anyway, we got through eventually, then had time to grab dinner since our SFO-SAN flight got delayed. Justin got gumbo and Crystal got a burger and tater tots. After dinner, Justin called his mom for mother's day, and then we boarded the flight back to San Diego, where we almost immediately fell asleep. Back in San Diego, we waited awhile for our bags, then hailed Heidi and drove back to Vista. We got back at 11pm, just in time to crash before heading for work (Crystal's first day, no less) the next morning.